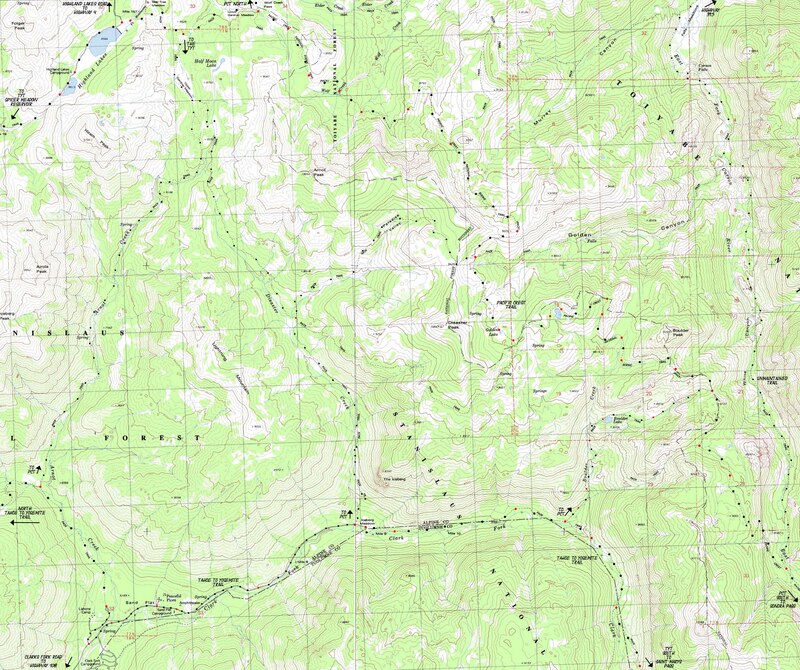 This map acts as an index to the Heart of the Carson Iceberg Wilderness. The main target of this map are the routes of the Tahoe to Yosemite and Pacific Crest Trails running North and South from their respective trailheads on Highway 4 to our North down to Highway 108 to the South across the Heart of the Carson Iceberg Wilderness. What makes this map effective is its depiction of the totality of three of the four trails connecting the TYT and PCT across the Carson Iceberg, while pointing at the route of the fourth route linking these classic trails. These four routes linking the PCT and TYT allow us to craft a wide variety of looping and "lollypop" backpacking trips around the Carson Iceberg Wilderness, from virtually any direction. The map above hints at our Eastern Entrance via the remote Corral Valley Trailhead, while highlighting Highland Lake's deep road access to trailheads accessing either the PCT or TYT. Hiking 2.56 miles South past the Clarks Fork Trailhead at the end of the Clarks Fork Road we encounter the Boulder Lake trail junction. From here we can either continue South up the Clarks Fork of the Stanislaus River towards Saint Marys Pass or hike up to the PCT above the East Fork of the Carson River via Boulder Lake. Hike the Boulder Lake trail up to Boulder Lake and on to the Boulder Lake trail junction on the Pacific Crest Trail. The total distance between the Boulder Lake Junction on the Tahoe to Yosemite Trail to the Boulder Lake Junction on the Pacific Crest Trail is 2.74 miles. The elevation difference is 1690 feet. This is the shortest of all 4 trails linking the Tahoe to Yosemite Trail with the Pacific Crest Trail through the Carson Iceberg Wilderness.